We are deep in the desert. Right in front of us there is a small valley, oddly scattered with palm trees. West of that valley, the hills we have to clear. Once we get inside this hilly terrain, long range engagements (in which we have such an awesome edge) will be impossible. Whatever happens in the hills, it will be a knife-fight. It's early in the morning and a moderate sandstorm has limited the visibility to 1 km. Based on the light resistance we found in the last hours and the lack of prepared enemy defenses, the enemy forces are likely conducting a mobile security mission. One hour ago, our Sqn command group has destroyed two PCs and one tank (see reference points in the map). At least 4 T-72s and 5 BMPs were seen hastily moving west. Our task is to clear the enemy from the sector indicated in the map and restore the screen line. Forces available for this mission are a US Cav Plt (6 M3 CFV, 2 M1 MBT) which I organized as a Hunter-Killer Plt (see previous post). The Squadron's aerial component is grounded until the climate conditions improve. We have no indirect fire support available for this mission. 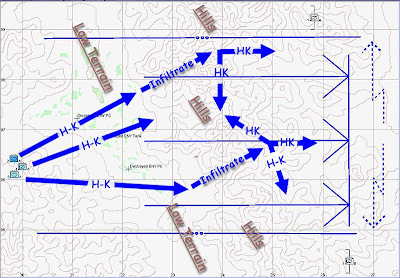 The infiltration/penetration of the hilly terrain of 3A HK team (southern flank) could have been made a bit more down south, near the southern edge of the sector. I opted for a small low terrain entrance a bit north than that because I wanted to make sure that team 3A could support team 2A.